In updated guidance released this afternoon by U.S. 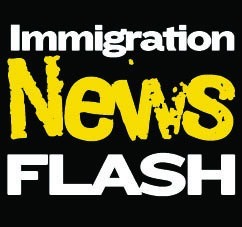 Citizenship and Immigration Services, the Obama Administration confirmed that recipients of deferred action are authorized to be in the United States and therefore considered to be “lawfully present” under federal immigration laws. The guidance should clarify the debate over whether beneficiaries of the Deferred Action for Childhood Arrivals (DACA) program are eligible for driver’s licenses. Acting under the belief that DACA recipients are not “lawfully present” under federal law, four states—Arizona, Iowa, Michigan, and Nebraska—have refused to issue driver’s licenses to DACA recipients. Separately, the administration also released updated statistics on the DACA program. Through Thursday, USCIS had received 407,899 requests for deferred action (an average of 80,000 per month since the program began), of which 394,533 had been accepted and 154,404 approved. USCIS received an average of less than 1,500 requests per day in January, down from a high of more than 5,700 per day in October soon after the program began accepting applications. The majority of DACA recipients continue to hail from Mexico and reside in California.